VATICAN CITY (CNS) — No disease makes a person impure; only sin does that, Pope Francis said. While being sick can impact a person’s whole being, “it in no way impairs or impedes one’s relationship with God. In fact, a sick person can be even more united to God,” the pope said Feb. 11, commenting on the day’s Gospel reading about Jesus healing a leper. 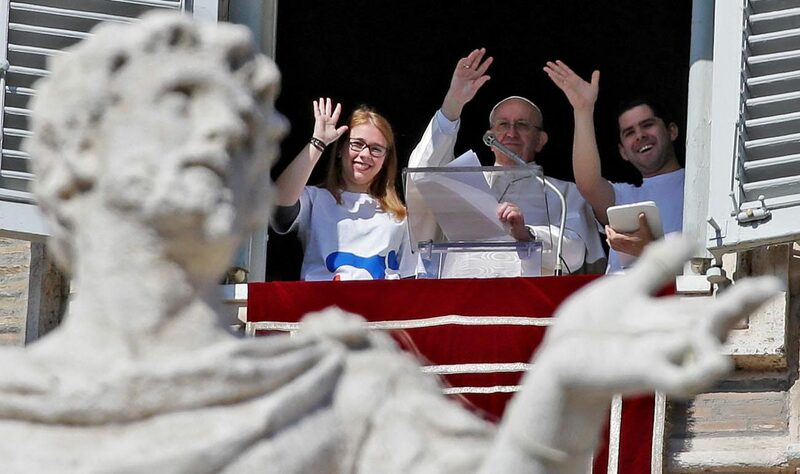 After reciting the Angelus prayer, Pope Francis was joined at the window of his study by two young adults. One handed him a tablet as he announced that the registration period for World Youth Day in Panama had opened. He clicked on the site — www.panama2019.pa/en/registration-of-pilgrims — and said, “There, I’m registered as a pilgrim for World Youth Day,” which will be held Jan. 22-27, 2019. Pope Francis also used his post-Angelus remarks as an occasion to wish a happy New Year to people in China and throughout the Far East; the lunar New Year begins Feb. 16.